You might have heard of the myTouch 3G Fender Edition and you probably already know that it is a limited edition of T-Mobile’s myTouch 3G. Unlike the standard edition, though, it packs a 3.5mm audio jack and comes with a generous 16GB microSD card. There are plenty of tracks included and as some pretty nice applications (Guitar: Solo and Music Light) are preinstalled. The music player has been revamped so now its UI is way user-friendlier. The limited edition myTouch 3G runs Android 1.6 but an update to 2.1 is supposedly in the works. Yet the greatest improvement over the standard version of the device remains the Fender Edition’s design. Now, I never thought of myself as a person that likes strange looking phones, but i like this one and it doesn’t even look like a phone. 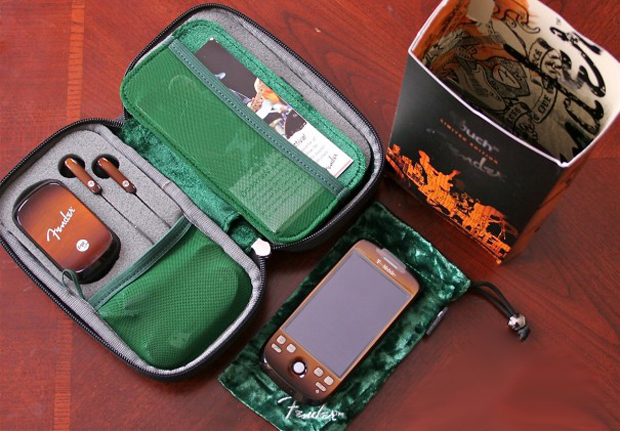 Enough talking, it’s time to check out what’s inside myTouch 3G Fender Edition’s box. As you can see, the spacious retail box doubles as a well padded carrying case. In there you’ve got space for the phone itself as well as for its USB cable, charger, earphones and some more accessories. Unfortunately, the T-Mobile myTouch 3G is exclusively available across T-Mobile USA’s stores and there is no word whether and when we can expect it to come to Europe.